I don't often write about music on this theater-centric blog, unless it's someone I really love and want to tell everyone about. Such is the case with Chris Thile and his Brothers of Punch. I've been a fan of Chris Thile's for over ten years, since his days in the bluegrass trio Nickel Creek (with siblings Sean and Sara Watkins). I distinctly remember seeing their video for "When You Come Back Down" and immediately buying Nickel Creek's self-titled debut album. I was mesmerized by Chris' voice, and I'm still hooked. The members of Nickel Creek have since gone their own way and have all made solo albums (Sara is performing at the Cedar next month). Several years ago Chris formed the band Punch Brothers with Chris Eldridge (guitar), Noam Pikelny (banjo), Gabe Witcher (fiddle and sometimes lead vocals), and Paul Kowert (upright bass, possibly the coolest instrument in existence). They've really gelled into a fantastic bluegrass band, appearing on The Tonight Show and opening for Steve Martin and the Steep Canyon Rangers. Each is a super talented musician in his own right, and together they create a thrilling musical experience. But it's Chris that I have a hard time taking my eyes off of. He's one of those artists where the music just flows through him from some unearthly place, and it's all he can do to bodily contain it. Definitely one of my favorite musicians to see live, and I try to catch him every time he's in town (even if it means going to Dinkytown* when there's a Gopher game). 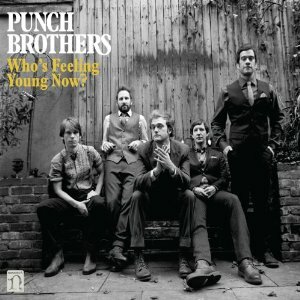 The Punch Brothers just released a new album last month entitled Who's Feeling Young Now, and it has taken up permanent residence in my car CD player. It's not traditional bluegrass, it's forward-thinking bluegrass, moving bluegrass into the future and pushing the boundaries of what it can be while still respecting the tradition. I love that. I also love their retro/classy/cool fashion style, with their ties and jackets and vests. I like that they dress up for the show, in their own unique way. 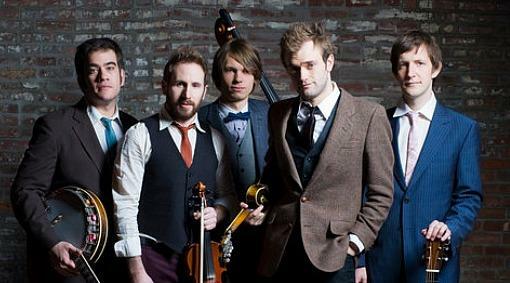 Here are the Punch Brothers performing one of their most popular songs, "Rye Whiskey," from their 2010 album Antifogmatic. And from their brand new album Who's Feeling Young Now, "It's No Concern of Yours" (a few more videos from the concert avalable on the cherryandspoon youtube channel). *The Varsity Theater is a really cool space (although I would have liked more seating; this is bluegrass, we can sit down), and has the most interesting bathroom I've ever seen. Tucked in the back upstairs, it's like a cave. All brick and plants and odd angles, with women's stalls on the right and men's on the left, and shared sinks in the middle with showerhead faucets that turn on with foot pedals. There are even comfy couches and chairs in case you want to hang out. Normally I can't see hanging out in a bathroom, unless it's as cool as this one.